The PMK formula was developed by Gordon Hutchings and is designed as a universal developer for a wide variety of modern emulsions used under diverse conditions. 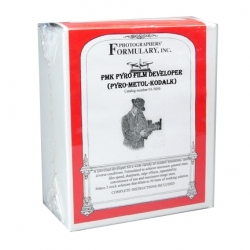 PMK stands for Formulary's Pyro-Metol-Kodalk. Kodak has changed the name Kodalk to Balanced Alkali - this is their proprietary name for sodium metaborate. Due to the unique tanning and staining action of pyro, its key ingredient, PMK provides both exceptional detail and gradation that no other commercial developer can rival, and its ability to separate nearly-adjacent tones (particularly in the highlights) is legendary. The formula is constituted to achieve the best overall results in consideration of the following technical criteria: sharpness, maximum image stain, minimum general stain, edge effects, film speed, flexibility for Zone System Plus and Minus development, stability, repeatability, convenience of use and long shelf-life. An alkaline fixer solution such as TF-4 is recommended for achieving maximum pyro stain on the negative. 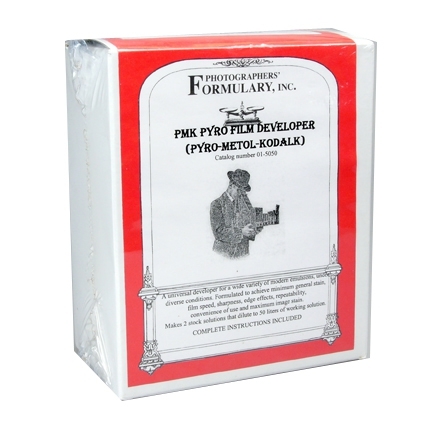 A conventional rapid fix may diminish staining effects of pyro and PMK formula. The PMK formula consists of two stock solutions. The 'A' stock is the developer agents and the 'B' stock is the alkali, or accelerator. Our stock solution dilutes to make 25 or 50 liters of working solution. The PMK formula consists of two stock solutions. The "A" stock is the developer agents and the "B" stock is the alkali, or accelerator. Our stock solution dilutes to make 25 or 50 liters of working solution. "With conventional developers, it is extremely difficult to render important atmospheric effects such as fog or mist convincingly in a print. A stained pyro negative, because of the continuous tone effect of the stain, prints fog like a cool liquid - a seamless water color effect that baffles the senses, as real fog does." Note: An alkaline fixer solution, such as Photographer's Formulary TF-4, is recommended to maintain maximum pyro stain on the negative. A conventional fixer is acidic and may diminish the staining effects.